Child support can be difficult to collect, even after a court order awards it to the custodial parent. This is a guide about collecting child support. If your ex was awarded a settlement from disability and you were awarded all your back child support in court, can the child advocate take it upon themselves to half that money up with another child obligation even though you have a court ordered paper saying it goes to you? This is a very serious Legal matter that can only be settled by an attorney as you have 2 "agencies" to deal with and only an attorney will know your rights in this case and it may have to go back to court to be settled. Do not wait to take care of this as once that check is sent it will be more difficult to correct - if in fact you are entitled to the full amount. Gather all of your paperwork and find an attorney ASAP. My husband was ordered to pay child support and left the country. Can I collect anything from his social security benefits? If so when? Thank you. If your question is left unanswered visit your state's Department of Family Services. Do you mean left your part of the US or left for another country? If he left for another country, you might have major problems. If you and he live in seperate states, that isn't real good either. My daughter has had trouble with child support from her "ex." States don't want to go after the absent parent unless they are between $5,000-$10,000 behind, because of the expense of bring them back to the state where the divorce and child support order took place. Is your "ex" currently on social security or are you talking about when he retires? You can't collect on it until he gets it, or if he would pass away, your kids would qualify for survivors benefits. Talk to you child support collection office, which in a lot of states is in the social services building, and they can tell you if they can take action or if you will need an attorney. "States don't want to go after the absent parent unless they are between $5,000-$10,000 behind, because of the expense of bring them back to the state where the divorce and child support order took place." This statement is not true. Domestic Relations will persue any case regardless of the amount owed. Moreover, because all of the states' domestic relations departments are interconnected with the Social Security Employer database there is no need for them to bring in the defendent into a particular state for a hearing. Employers are required to report all new hires and their SS numbers and this information is fed into a database that will bring up any judgements against them (like a child support order). Pay garnishment would be automatic. Also, if there is any tax refund owed to him, that will be attached automatically as well. If he is paid under that table or if he left the country that would be a different issue until he is located. You need to contact social security and the attorney general in your state to learn what the law is in your case and what your rights are. You may want to contact an attorney. You could check with your city hal to locate an attorney that will work for no fee if you don't have the cash to hire an attorney. It is not a felony unless the back support is at least $5,000. There are other circumstances that will make it a felony at that level also, but it is not an automatic felony at that point. You used to have to sign up for the tax check to be given to you, but I received one this year again now. If your ex is out of the country he will likely not be forced to pay. It is difficult to get other countries to accept foreign warrants. Good luck and don't give up. Depending on the state laws you are in. Many states attach it to tax returns, you can have your license pulled and be jailed for avoiding child support. You need to see a lawyer and/or humane services of your county if your child gets any services of any kind. My friend's disabled daughter is 30, works, and gets state aid and he is still required to pay child support. She still lives with her mom and does have the mental capabilities to tend to herself. She even has a boyfriend that wants to marry her, but mother says no because she would lose the finacial help. How can he get free of this? He lost his job and they are taking him to court. He is $1,800 behind and sinking. Their mother reopened the case 3 years after the last son turned 18. The son has been paying the back child support because he doesn't want his father going to jail. The father lost his job two years ago and lives with his older son. The court hearing is in a few days, do you think they will throw it out or do you think the son is going to have to pay the rest of it? The best thing to do would be to talk to your local office of child support collection. However, I am sure the father can find some kind of job, it might not be what he wants, but there are jobs out there - flipping burgers, etc. I have heard Judge Judy tell absent parents that if nothing else they can get out there and pick up cans to sell, so that they can support their kids. It isn't right that the son is paying child support to keep his Dad out of jail. What happens when the son wants to get married? Furthermore the Dad is supposed to be the most mature person there, and should take responsibility. You do not say why the father is not working or able to pay this back child support (arrears). If he can show the court that he is not able to work or applying for Social Security Disability they may take this in to consideration. Is he receiving Social Security Supplement Income (SSI) if so the court will more than likely excuse the arrears as someone who receives SSI cannot pay child support. Cannot fully answer your question without knowing the circumstances of the debtor parent (father). She should have gone after the father before her last son turned 18. Why is she taking money from her son who is probably trying to get established in his life. Not only is he paying his dad's debt, but his dad is living with him. His mother is also living off of him. The poor kid has two dead beat parents. Both parents should be out looking for work and not sponging off of their children. I'm 69 years old and would be embarrassed to sponge off my kids! My daughter is on Social Security Disability. Her 14 year old son desides he wants to go live with his father. The family court judge granted his wishes. My daughter now has to pay $175.00 a month child support. She even has a daughter to care for but that didn't matter to the family court. She is struggling so. We try to help her when we can. Being on Disability doesn't mean you do not have to pay child support. According to Social Security your ex wife will receive SS benefits sooner if you have a kid that is 16 years old below. In my case, we have a 2yr old kid and I'm also paying a child support. Will my ex wife receive SS benefits at the same time with the child support? I am trying to collect child support from my stepdaughter, but she's on SSI. I know they won't touch it, but she's also working. Will child support take payments from her work check even if she's on SSI? I have been raising her 7 year old son for his whole life with no help from anyone. Even the state won't help because I'm not his biological grandma. I also have 3 children myself I don't know what else to do. She thinks this is funny and sent me a text when she received the paperwork saying, "Haha nice try, but I get SSI they aren't going to make me pay". I just don't know where else to turn. I recently found out that my grandmother was getting a child support check for me and I wasn't in her care nor custody so I have never seen the money. Is there anyway to get that money now that I am aware of these actions? My child is an adult and no longer lives with me. Her father owes back pay in child support that he is paying it out of his SSI. Will my daughter receive the check with her name on it because she is an adult or will I? If my son's dad is collecting retirement benefits can I collect child support? And how do I find out and get started? Thank you! Can a biological father be made to pay child support for children who, because their mother having been re-married for 1 year, filed for and did receive survivors benefits from the Social Security Administration from the recently deceased spouse? No adoption took place, the children were not his biologically, and still carry the birth father's last name. The children were conceived out of wedlock, and paternity was never established. All children now over the age of 18. Thank you. Does anybody know how I can collect child support benefits from my ex husband who is currently collecting VA benefits and is enrolled in school getting that paid for too. He has 2 grown children and has never paid any support and will probably never get a real job. He lives off woman and their money. Can I get his benefits garnished? Does anybody know? I am posting this question to your forum regarding my child who is 6 yrs. old and the father is a 78 year old American. The father of my child is now disabled after his stroke and heart attack. He cannot remember anything anymore so he has had a guardian appointed by the clerk of the court. Because of this, how can I get my child support? What should I do? I am in the Philippines; I bore my child out of wedlock. I hope to get help from here. Thank you. If the father had a large change in income from 76,000 to 101,000 and did not tell the mother, however his income has dropped back to 85,000 per year now, how does that work? Shouldn't he have been obligated to report such a significant change? My child is 18 now and her father only made one payment and that's because we go to court next week. He made the payment this month; what will the judge do? He always quits his job and he never files taxes. How could we know what the judge will do? Even if any of us were judges, each judge does different things within the law. If he changes jobs frequently his wages can still be garnished. That is providing his jobs don't pay him under the table. He can always be jailed for non-payment, he can also end up having his driver's license taken away. If he is works and gets paid legitimately his income tax refund can be awarded to you. Did you ever work with your state's Department of Child Support, while your daughter was a minor? They do a remarkably good job of tracking down absent parents and getting them on record as having to pay a certain amount of child support every month. Well - redhatterb certainly gave some excellent advice. You did not say how old your daughter was when you first divorced so we have no way to know how long you put up with this nonsense. You should have had your payments set up to go through the court at the time of your divorce as you already knew your husband was undoubtedly a deadbeat. That being said - the judge may not be as hard on your ex as the child may no longer need support. It would have been better for you and your child to have followed through with this at an earlier time. The court is pretty good at collecting support if payments are set up right in the beginning. I do know that some people have had to "help" the court by informing them of any information you hear about the "ex" as they only receive information through legal ways. Why not cause the ex some problems if he is not even trying to do his share of support? I wish you luck but it now seems a little late as you may get a judgement but that is just a piece of paper unless he has some asset that you can "take away" and even doing that may cost more than its worth. My boyfriend and I have two kids together. Our oldest he pays child support for. If we were to get married would he still have to pay child support for our oldest? If you are living together, he shouldn't have to pay child support at all. If you have two kids together, why isn't he paying child support for both of them and is the child support he's paying for the oldest one court ordered. This just doesn't make any sense. When people live together and have kids one or both parents are supporting the family any way. Hi - I agree with the other poster - this does not really make sense? Seems if you are living together - support would be mutual between both parties? Perhaps there is more than you are stating? The custodial parent has not ever gotten support from the noncustodial parent for child who's 9 years old. Also back pay may have already been paid to the noncustodial parent because he lied and said the son lives with him. I already sent papers of custody for the custodial parent in October 2011. I never heard any thing about it. What's next? I need help first. I don't understand, is it your "ex" that claimed the child lived with him and were you paying child support or what? 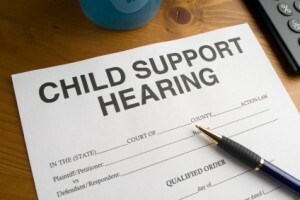 Call the Department of Social Services in your area and ask for child support enforcement. They should be able to help you. If you mean the non-custodial parent has recieved social security back pay. Social security does not pay back pay for dependants but the payment starts after a parent goes to the office and signs a child up. This is done after a person has been apprved and starts drawing social security. If you think this non-custodial parent signed up the child as thier dependant, you need to make an appointment (or just go) with the social security office. You can call and may get some of your questions answered. they are always most helpful. Good Luck. I was wondering is there anything I can do about my ex collecting survivor benefits from her son's biological dad's Social Security and child support from me? I found out my son wasn't mine when he was 5 and shortly after that his mom changed his name cuz she found out his biological dad had passed away so she could receive benefits. I am paying child support for him still while she receives survivor benifits. He still has his original name also, so idk if he has two socials or one with two names! Is there anything I can do? I just don't think this is fair because I have other children I can do more for. I am trying to get child support from my son's father and the child support agency put a $0 amount on him because he wasn't working. I called and they looked in their computer and saw he had earnings from June. I applied for a modification. Could they make me pay him child support because I make more money than him from my veteran's disability? I am a 23 year old mother of two. At first I lied to child support so that my baby's daddy would not have to pay anything because I was stupid and thought he would step up and be around. Now I have two kids by him and he still does nothing! If I go back to child support and tell them I know who the father is will I get into trouble because I get food stamps, cash assistance, and have a medical card, and his name is not on either one of my son's birth certificate? Please help. My ex husband received the order signed by the judge, but he only paid 25% of the order. What can I do to make him paid the rest? You can call or visit your county court house, it must be the county where you live. They should have a child support enforcement office located there, in the building. They can help you with all of the steps that need to be taken. If you are applying for help at your social services department, again in your county of residence, they also can help you with collecting child support from the absent parent.